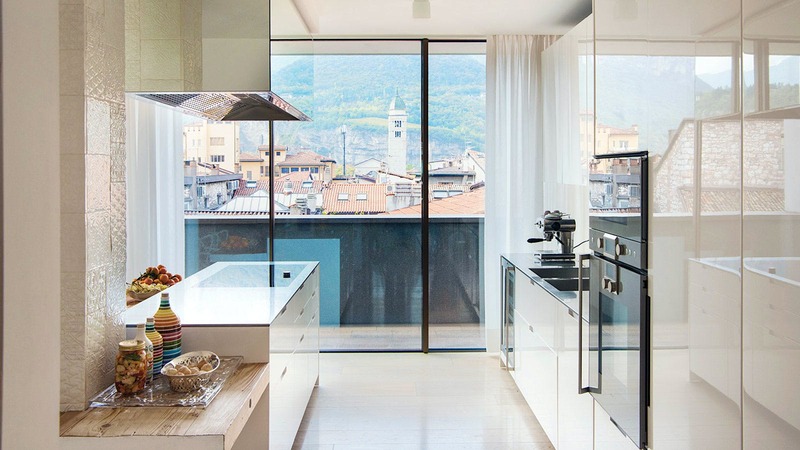 Matteo and Valentina Lunelli’s airy duplex penthouse balances modern design with views of mountains, rooftops and Trento’s historic Torre Civica belltower. 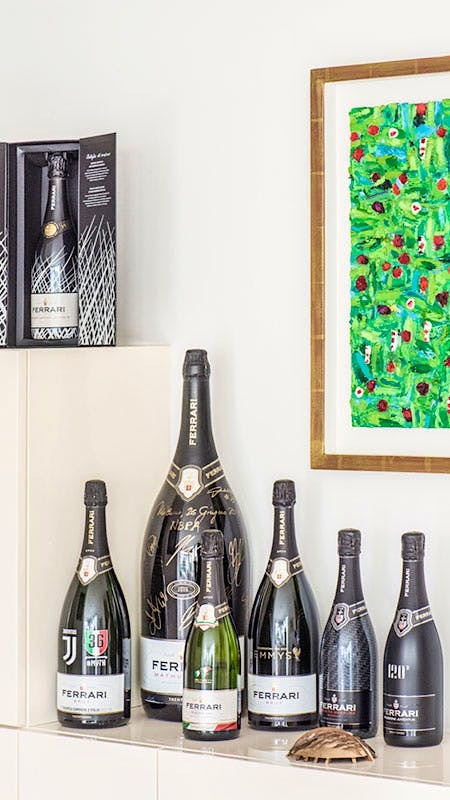 In 2003, Matteo, now 45, left a career at Goldman Sachs in London to join the family wine estate, one of Italy’s most consistently excellent producers of sparkling wine. His wife, Valentina, 45, hoped to settle in the city, whereas Matteo wanted the country. 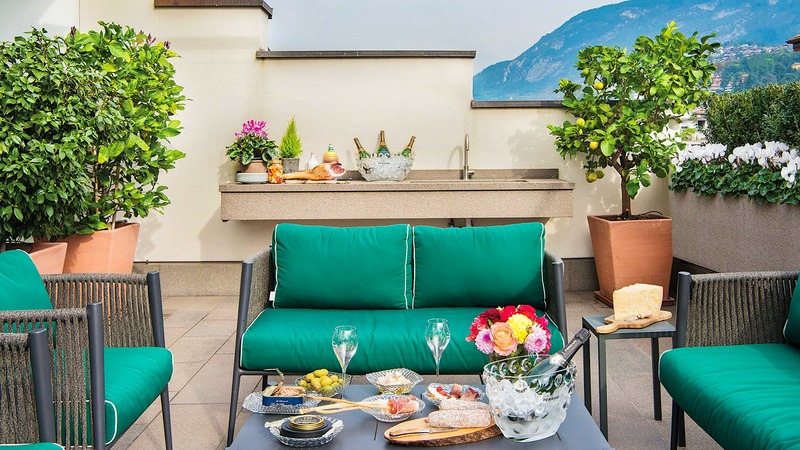 Ultimately, they struck a compromise: They’d move into the urbane, modern duplex penthouse of a six-story building in the heart of historic Trento, surrounded by mountains. There was just one catch: That duplex didn’t yet exist. But the building did. A centuries-old palazzo turned hotel, it had been bombed and heavily damaged during World War II. In 1954, a renovation added a fifth and sixth floor. 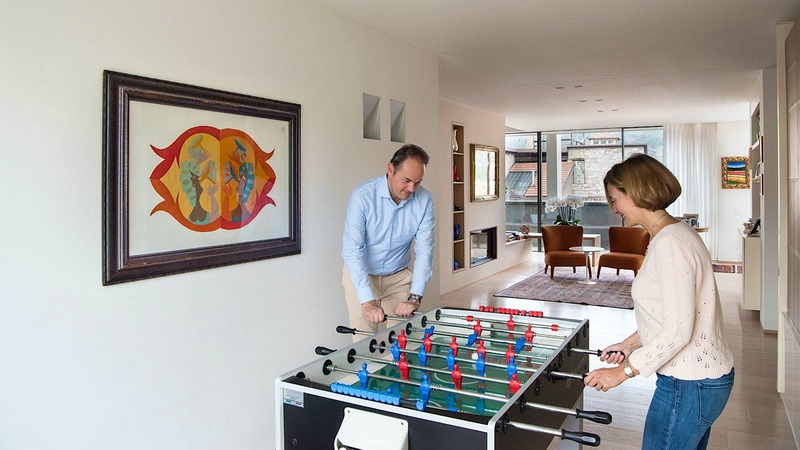 The Lunellis’ real estate concern bought the building in 1993, converting it into rental apartments, and Matteo and Valentina moved into a top-floor unit in 2003. 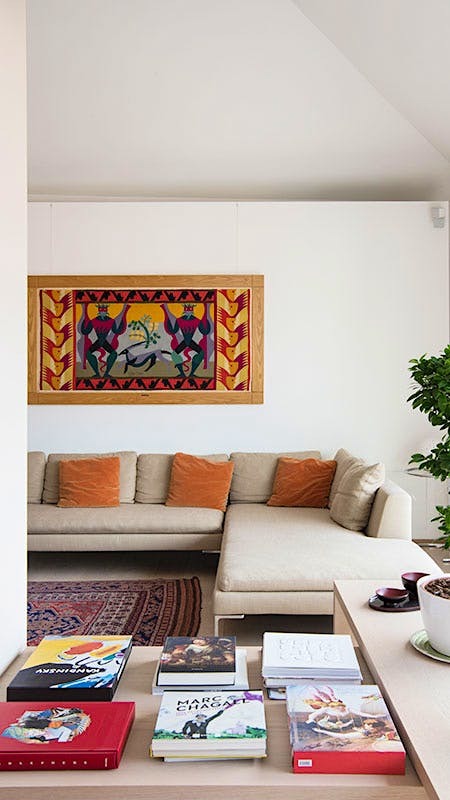 Six years later, they bought the top two stories, rolled up their sleeves and prepared to combine four modest apartments into one roomy residence. “When you build [a home] not from scratch but from an existing situation, it is not an easy project,” Matteo says. “It was very complicated.” The process took two years. 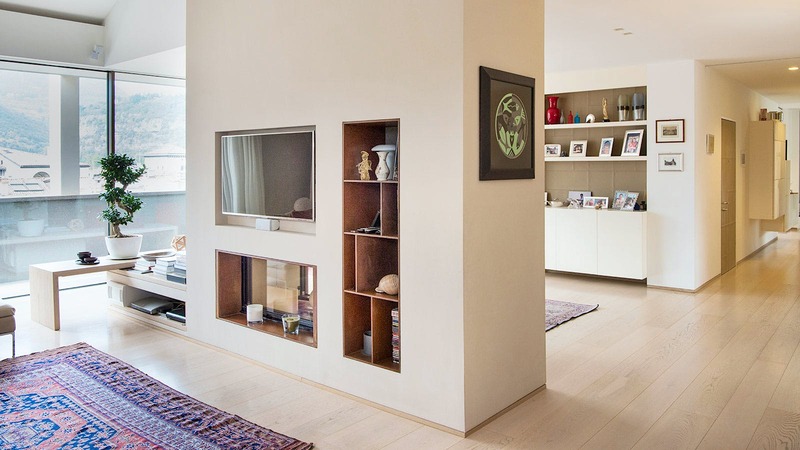 The Lunellis worked with noted architect Matteo Thun to let the rugged surroundings into the apartment. Thanks to the previous midcentury renovation, there were already bigger windows than are typical of old buildings. “It’s a warm apartment but with a lot of light,” Valentina says. Under Thun’s direction, frameless Sky-Frame sliding doors were installed to connect the living room to a large deck, and the floor-to-ceiling window in the kitchen makes it feel as though you’re outside and inside simultaneously. The kitchen is a high-gloss matrix of geometric precision, with bits of texture and warmth from a reclaimed-wood table and an eye-catching column wrapped in porcelain tiles. “We had to have a column from a structural point of view,” Matteo explains. So they turned it into a design element. Valentina feeds the family “a typical Mediterranean cuisine,” she says. You won’t find much butter in her kitchen, but there’s plenty of good olive oil for “very simple cooking but with very good materia prima.” And Matteo has a couple pasta dishes up his sleeve: During truffle season, he makes tagliolini al tartufo, and an Ischian chef friend, Nino di Costanzo, taught him and the kids—Riccardo, 14, and Vittoria, 12—to perfect their pasta al pomodoro. Matteo is a great fan of the Italian convention of aperitivo, or predinner snacks and wine. He collects specialty products from all over Italy—Calvisius caviar from the town of Calvisano, Cerignola olives, the Parma salumi culatello, cured Sardinian bluefin tuna, Neapolitan bufala mozzarella, Frantoia Muraglia olive oil from Puglia—all of which winds up at aperitivo hour, paired with a dry sparkler. The greater part of the Lunellis’ wine collection resides in off-site storage, but they cellar about 300 bottles in the basement of the apartment building, which is mercifully dark, cool and constant. A small stash of drink-now bottles live in a Gaggenau wine cooler in the kitchen. They love to collect wines from their children’s birth years. From Riccardo’s vintage of 2004, there’s Tenuta San Leonardo and the Lunellis’ own top bottling, Giulio Ferrari Riserva del Fondatore, aged for 10 years before release. From 2006, Vittoria’s birth year, there’s Giulio Ferrari Rosé, the first vintage-dated bottling of that cuvée, and Sassicaia. The Lunellis enjoy their aperitivo on the deck during milder weather, but during chilly northern Italian winters, they gravitate to the kitchen. “It’s natural that it is the heart of the house,” Matteo says. “It’s part of the Italian culture, in a sense, but also because of what we do.” Here, with a glass of bubbly in hand, the horizon shifting around them, the Lunellis are home.